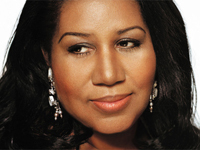 Aretha Franklin is one of the giants of soul music, and indeed of American pop as a whole. More than any other performer, she epitomized soul at its most gospel-charged. Her astonishing run of late-’60s hits with Atlantic Records — “Respect,” “I Never Loved a Man,” “Chain of Fools,” “Baby I Love You,” “I Say a Little Prayer,” “Think,” “The House That Jack Built,” and several others — earned her the title “Lady Soul,” which she has worn uncontested ever since. Yet as much of an international institution as she’s become, much of her work — outside of her recordings for Atlantic in the late ’60s and early ’70s — is erratic and only fitfully inspired, making discretion a necessity when collecting her records. Franklin’s roots in gospel ran extremely deep. With her sisters Carolyn and Erma (both of whom would also have recording careers), she sang at the Detroit church of her father, Reverend C.L. Franklin, while growing up in the 1950s. In fact, she made her first recordings as a gospel artist at the age of 14. It has also been reported that Motown was interested in signing Aretha back in the days when it was a tiny start-up. Ultimately, however, Franklin ended up with Columbia, to which she was signed by the renowned talent scout John Hammond. Franklin would record for Columbia constantly throughout the first half of the ’60s, notching occasional R&B hits (and one Top 40 single, “Rock-a-bye Your Baby With a Dixie Melody”) but never truly breaking out as a star. The Columbia period continues to generate considerable controversy among critics, many of whom feel that Aretha’s true aspirations were being blunted by pop-oriented material and production. In fact, there’s a reasonable amount of fine items to be found on the Columbia sides, including the occasional song (“Lee Cross,” “Soulville”) where she belts out soul with real gusto. It’s undeniably true, though, that her work at Columbia was considerably tamer than what was to follow, and suffered in general from a lack of direction and an apparent emphasis on trying to develop her as an all-around entertainer, rather than as an R&B/soul singer. When Franklin left Columbia for Atlantic, producer Jerry Wexler was determined to bring out her most soulful, fiery traits. As part of that plan, he had her record her first single, “I Never Loved a Man (The Way I Love You),” at Muscle Shoals in Alabama with esteemed Southern R&B musicians. In fact, that was to be her only session actually at Muscle Shoals, but much of the remainder of her ’60s work would be recorded with the Muscle Shoals Sound Rhythm Section, although the sessions would actually take place in New York City. The combination was one of those magic instances of musical alchemy in pop: the backup musicians provided a much grittier, soulful, and R&B-based accompaniment for Aretha’s voice, which soared with a passion and intensity suggesting a spirit that had been allowed to fly loose for the first time. In the late ’60s, Franklin became one of the biggest international recording stars in all of pop. Many also saw Franklin as a symbol of black America itself, reflecting the increased confidence and pride of African-Americans in the decade of the civil rights movements and other triumphs for the black community. The chart statistics are impressive in and of themselves: ten Top Ten hits in a roughly 18-month span between early 1967 and late 1968, for instance, and a steady stream of solid mid- to large-size hits for the next five years after that. Her Atlantic albums were also huge sellers, and far more consistent artistically than those of most soul stars of the era. Franklin was able to maintain creative momentum, in part, because of her eclectic choice of material, which encompassed first-class originals and gospel, blues, pop, and rock covers, from the Beatles and Simon & Garfunkel to Sam Cooke and the Drifters. She was also a fine, forceful, and somewhat underrated keyboardist. Franklin’s commercial and artistic success was unabated in the early ’70s, during which she landed more huge hits with “Spanish Harlem,” “Bridge Over Troubled Water,” and “Day Dreaming.” She also produced two of her most respected, and earthiest, album releases with Live at Fillmore West and Amazing Grace. The latter, a 1972 double LP, was a reinvestigation of her gospel roots, recorded with James Cleveland and the Southern California Community Choir. Remarkably, it made the Top Ten, counting as one of the greatest gospel-pop crossover smashes of all time. Franklin had a few more hits over the next few years — “Angel” and the Stevie Wonder cover “Until You Come Back to Me” being the most notable — but generally her artistic inspiration seemed to be tapering off, and her focus drifting toward more pop-oriented material. Her Atlantic contract ended at the end of the 1970s, and since then she’s managed to get intermittent hits — “Who’s Zooming Who” and “Jump to It” are among the most famous — without remaining anything like the superstar she was at her peak. Many of her successes were duets, or crafted with the assistance of newer, glossier-minded contemporaries such as Luther Vandross. There was also another return to gospel in 1987 with One Lord, One Faith, One Baptism.